1. AY-390 380-400 MHz Yagi 20 MHz. 11 dBd. 2. AC12-390 380-400 MHz Fiberglass 20 MHz 12 dBi. 5. AC3-390 380-400 MHz. Fiberglass 20 MHz. 3 dBi. 6. AY-400 380-420 MHz Yagi 40 MHz 11 dBd. 7. SD3-400 380-420 MHz Dipoles 40 MHz. 3 dBd. 8. SD6-400 380-420 MHz Dipoles 40 MHz 6 dBd. 9. SD9-400 380-420 MHz Dipoles 40 MHz 9 dBd. 13. AY-420 410-430 MHz Yagi 20 MHz 11 dBd. 15. AC3-420 410-430 MHz Fiberglass 20 MHz 3 dBi. 17. AC9-420 410-430 MHz Fiberglass 20 MHz 9 dBi. 18. AY-460 450-470 MHz Yagi 20 MHz. 11 dBd. 19. AC12-460 450-470 MHz Fiberglass 20 MHz 12 dBi. 20. AC3-460 450-470 MHz Fiberglass 20 MHz 3 dBd. 21. AC6-460 450-470 MHz Fiberglass 20 MHz 6.8 dBi. 22. AC9-460 450-470 MHz Fiberglass 20 MHz 9 dBi. 23. AY-840 806-869 MHz Yagi Entire Band 11 dBd. 24. AC3-840 806-869 MHz Fiberglass Entire Band 3 dBd. 25. AC9-840 806-869 MHz Fiberglass Entire Band 9dBd. 27. AC6-840 806-870 MHz Fiberglass Entire Band 6 dBd. Antenna Experts specialized in designing and manufacturing of V-Polarized, H-Polarized & X-Polarized antennas for TETRA/TETRAPOL Antenna, CDMA 450 antenna, GSM 450 antenna, CDMA 800 antenna, GSM 800 antenna, CDMA 850 antenna and GSM 850 antenna are the result of the consequent continuing development on the basis of the long experience with TETRA technology. 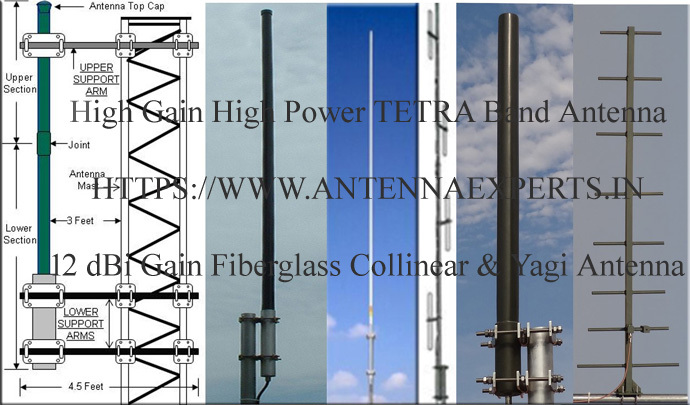 Antenna Experts manufacture TETRA Band Marine Antennas, TETRA Marine Band Fiberglass Collinear Antennas, Stacked Dipole Array and TETRA Marine Band Yagi Antennas for 380-400 MHz, 410-430 MHz, 380-420 MHz, 450-470 MHz and 806-870 MHz with Unity, 3 dBi, 3dBd, 6.8dBi, 6dBd, 9 dBi, 9dBd, 10dBd,12 dBi and 12dBd omnidirectional gain. High gain fiber glass TETRA collinear antennas are available in broadband version, to cover the full frequency range of 380 - 512 MHz. The reliability of our specially designed V-Polarized tetra antennas has been proven for more than a decade. Fibreglass Collinear TETRA antenna radome of 45 mm are made of an exceptionally stiff fiberglass tube, which results in a maximum tip deflection of 3° with a 3 m long tube at wind velocities up to 180 km/h. Our fiber glass collinear tetra antennas uses multiple vertical radiating elements, stacked vertically, fed in-phase to increase the gain of omni antennas. A range of heavy-duty TETRA Collinear Antenna with high gain to super high gain tetra omni antenna are designed for use in TETRA networks. TETRA Collinear Antennas in this range are carefully designed to minimize low passive inter-modulation products to help reduce network interference. These omni-directional TETRA antennas are housed inside a high-strength fiberglass enclosure and manufactured to the highest quality standard ensuring long term reliable operation. Our SD series heavy-duty array of two/four/eight centre-fed dipole antennas with molded phasing harness spread/mounted on an aluminum boom designed for TETRA network applications. TETRA Stacked Dipole Antennas in this range are carefully designed to minimize low passive inter-modulation products to help reduce network interference. Produced to the highest quality standards, these robust tetra stacked dipole antenna designs will ensure reliable operation in harsh environmental conditions. Our TETRA stacked dipole array uses multiple vertical radiating elements, stacked vertically, fed in-phase to increase the gain of omni antennas. Our AY series tetra Yagi antennas offer a wide frequency band (380-430MHz, 410-470MHz and 806-870MHz) tetra antenna for Trunked Radio TETRA applications. Our TETRA Antenna Produced to the highest quality standards, these robust antenna designs will ensure reliable operation in harsh environmental conditions. Low IMP-rated of tetra yagi models provide consistently lower noise floor over the life of the antenna, essential for multi carrier transmission. The AH series antennas are circular polarized helical antenna which uses extended stubs to provide the greater gain while maintaining the wider beam-width. This high-gain low-profile antennas use Circular Polarization Antenna Technology - which delivers better penetration through obstruction and interference. AH-405 helical antenna is a commercial grade antenna which provides superior performance over entire 380-430MHz band. Both Right Hand Circular Polarized (RHCP) and Left Hand Circular Polarized (LHCP) helical antenna models are available. The AH-405 Helical Antenna is light weight, broadband and rugged helical antennas, supplied with fiberglass radome to protect the antenna from environment. Cylindrical enclosure is used for low wind loading and for minimal effect of ice formation on the helical antenna operation as well as providing an aesthetically pleasing appearance. All of our TETRA antennas are marine variant. These tetra antennas are housed either in fiber glass radome or in ABS radome. Both are extremely rigid and highly transparent to the RF signals. The radiating elements of TETRA Marine band antennas are made of Brass and phasing systems are of Copper. Support pipe is made of 6063T6 ultra corrosion resistant architectural anodized aluminum alloy. Mounting hardware is made of type 316 marine grade stainless steel. All these features make these antennas highly suitable for marine environment.